Johann Hoch and HH Holmes: Partners in Crime? It’s kind of a disturbing thing to have “favorite serial killer” at all, but mine is probably Johann Hoch, the goofball who spoke like a German dialect comic, looked like the dude on the Pringles can, and had already a proposed to what may have been his 55th wife when they caught him. Wife #53 was a Chicago woman who ran a candy shop near Halsted and Willow; he had slipped her some arsenic shortly after the wedding, thrown a big pity party for himself while she lay in agony, and then proposed to her sister while the coffin was still in the room. HE married the sister a day or two later, then took her money and ran. “All the women for Johann go crazy, ja?” We went to Hoch’s burial place on our latest podcast. When he was caught and brought back to Chicago, the Chicago American started spreading all sorts of rumors about him, like one that he was a twin brother of Louis Thombs, a guy who had been hanged a couple of years before, and that he had enchanted women by playing a magic zither of some sort. The American was famous for making up stories to sell papers (it was owned by William Randolph Hearst), but one by one, people who had lived in the castle lined up to identify Hoch. There were some holdouts, like EC Davis, the jeweler, who was generally known to tell it like it is; he said that he’d never seen Hoch in his life. But other residents swore that Hoch had lived at the castle and collected their rent under the name Jake Hecht. In Richard Lindberg’s recent book on Hoch, he speculates that, while the police didn’t believe Hoch had been in the country until 1895, by which time Holmes was in jail, he had deluded the police with a web of lies, and had, in fact, been a worker at the castle. I’m a bit of a doubter. Davis the Jeweler was generally one of the more reliable witnesses in the crowd (though that isn’t saying much). They also brought in M.G. Chappell, the skeleton articulator, to identify Hoch. He identified him, but he was not exactly a reliable source. No one from the castle had ever seen Chappell when he came there to talk to police in the first place, and most of what he told them was quickly dismissed; Chappell’s family said he was a drunk who was given to making up wild stories. I’ve always thought that the Holmes/Hoch thing was just an example of the papers playing “connect the dots” with criminals, which they loved to do in those days. The “confession” itself was sort of a joke; of the 27 murders he confessed to, at least three were of people who weren’t dead yet. Several more were people who may never have existed, or had already been shown to have died of some other cause. But there were a couple where he didn’t give names, and were therefore hard to refute. 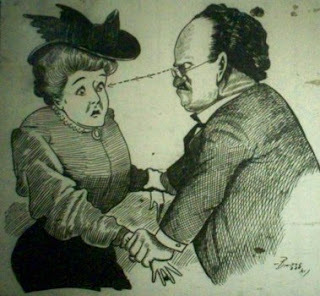 One of these he blamed on a castle “tenant.” The man had grown tired of his wife and had his eye on a wealthy widow, whom Holmes suggested they kill. The man had balked, but took Holmes suggestion to come live at the castle with the widow, and that they’d kill her if life with her became intolerable. This happened in due time, and Holmes had killed the woman with chloroform (his preferred method, really) while the man held her down. This, according to Holmes, started the man off on a life of crime. Leaving one’s wife to marry and kill a wealthy widow sounds like Hoch to a T.
Of particular note here is that that particular part of the confession is different in the two versions of the confession Holmes wrote. He wrote one, the best known, for the Philadelphia Inquirer, and then seems to have immediately copied down another version for the New York Journal, both of which printed hand-written notes in which Holmes said that what they were printing was his real – and only – confession. The two are mostly the same, except that the Journal version (which was the version published in Chicago papers) leaves six of the stories out, and is missing a word or sentence here and there from other sections. There’s only one section in which the Journal version is longer than the Inquirer, and that’s the story of the man in the castle who killed the wealthy widow.